R STEVIE MOORE - "Meet The R Stevie Moore"
Collected tapes from "The Godfather of Home Recording"
Beginning in the early 70's and continuing to the present day, Moore - the errant son of a Nashville session man who worked with Elvis and Johnny Cash - has recorded countless tapes and CD-Rs from the comfort of his Tennessee home studio. Moore's outsider status, you suspect, owes much less to the music - Beatles-esque experimentaion and slanted garage pop - than the eccentric, damaged lyrics within. Meet The R Stevie Moore is a welcoming toe in the waters of Moore's massive discography, and listen out for the genesis of Moore acolyte Bob Pollard's Guided By Voices in "You and Me". "The self styled "Godfather of home recording", like those who followed in his wake (Lou Barlow, The Dead, The Freshies, et al), understands that imperfection is part of the appeal, that the blips and pauses and lo-spun pianoforte are as vital to his music as the order the notes are played in. It's odd then, to hear his music (think The Beatles, Jad Fair, XTC, cheerily askew power pop) cleaned up on this CD collection. Another 'forgotten' hero existing in popular music's countless slipstreams, Moore - like so many - is experiencing a renaissance thanks to that ultimate leveller the Internet. I'd love to hear this on vinyl." This self-compiled 24-track sampler is little more than a dip into the vast ocean that is the 400-album discography of the legendary R Stevie Moore. son of veteran Nashville bass player Bob Moore, the ridiculously prolific and crazily eclectic R Stevie is widely considered the king of lo-fi music. Recording in his home and selling his tapes direct to his fans, Stevie has for the last four decades effectively been functioning as a one-man underground label. His range of styles run across power-pop, punk, pscyhedelia, garage rock, electronica, synth-pop and even the odd burst of prog, all while having completely bypassed the conventional music business, apart from the odd vinyl release on his uncle Harry's HP label and New rose. Billed as his 401st album, this selection finds Stevie sounding at various points like a bargain basement relative of Brian Wilson, Syd Barrett and Todd Rungren, and includes his classics Goodbye Piano and I Wish I Could Sing. I ment this wonderful man last year and we hung out for the evening, his partner, Krys made us dinner and we talked and laughed. I was at the end of a long trip and was exhausted but delighted to have met this unrecognised genius. He played a few things on his guitar - my minidisk was broken. I have a few of his many albums, on CDR but this one is a must-have for anyone's record collections. 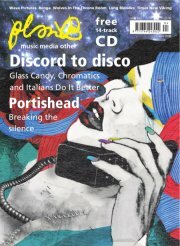 Excellent, uncompromising and connects to pop as well as the still-intact underground. 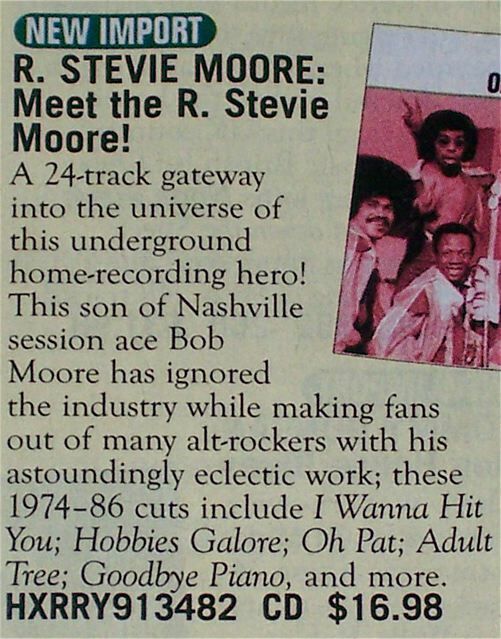 I have long championed the genius that is R. Stevie Moore. Another year, another label and another compilation but no complaints from me. This in some respects is the perfect intoduction to Stevie; The songs are generally from a reasonably compact time frame from his 400 plus albums and also tend to focus on his more pop oriented material. The mastering has worked very well bringing out more detail on 30 to 40 year old tapes highlighting Stevie's vocal and instrumental prowess although some limitations are more evident but what the heck; pay particular attention to his acoustic guitar, drums and bass work. I have all of these songs on their original albums and there is little overlap with previously issued compilations and to hear these songs out of their original context also yields new pleasures. The sleeve notes are excellent and one can hope that Cherry Red will delve further into Stevie's tape box. Who knows we may finally get reissues of other Stevie classics like "What's The Point!!??" and "Glad Music".